A provocative analysis of how Christianity helped legitimize the death penalty in early modern Europe, then throughout the Christian world, by turning execution into a great cathartic public ritual and the condemned into a Christ-like figure who accepts death to save humanity. The public execution of criminals has been a common practice ever since ancient times. 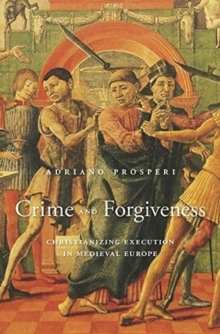 In this wide-ranging investigation of the death penalty in Europe from the fourteenth to the eighteenth century, noted Italian historian Adriano Prosperi identifies a crucial period when legal concepts of vengeance and justice merged with Christian beliefs in repentance and forgiveness. Crime and Forgiveness begins with late antiquity but comes into sharp focus in fourteenth-century Italy, with the work of the Confraternities of Mercy, which offered Christian comfort to the condemned and were for centuries responsible for burying the dead. Under the brotherhoods' influence, the ritual of public execution became Christianized, and the doomed person became a symbol of the fallen human condition. Because the time of death was known, this "ideal" sinner could be comforted and prepared for the next life through confession and repentance. In return, the community bearing witness to the execution offered forgiveness and a Christian burial. No longer facing eternal condemnation, the criminal in turn publicly forgave the executioner, and the death provided a moral lesson to the community. Over time, as the practice of Christian comfort spread across Europe, it offered political authorities an opportunity to legitimize the death penalty and encode into law the right to kill and exact vengeance. But the contradictions created by Christianity's central role in executions did not dissipate, and squaring the emotions and values surrounding state-sanctioned executions was not simple, then or now.